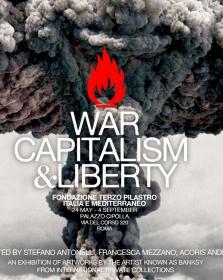 ‘War, Capitalism & Liberty’, is an exhibition held at the Palazzo Cipolla in Rome from May through to September 2016. 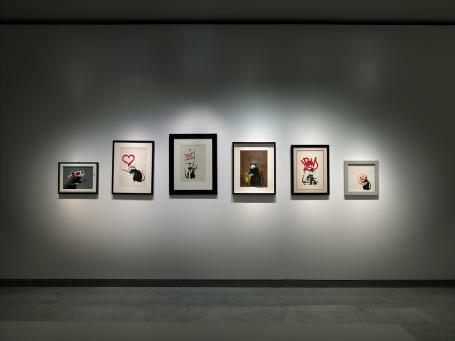 The exhibition is a re-collective of the internationally renowned street artist Banksy, in which it unravels his body of work for the public to visit, enjoy and even reflect upon the socio-political, and economic issues he addresses throughout. The expansiveness of the show even invites an educational aspect due to the critical nature of Banksy’s works that invite such reflections. The non-profit exhibition engages in a rather interesting narrative where its host carries a traditional and monumental history, only to present a radically different, and totally modern illustration of our society today. 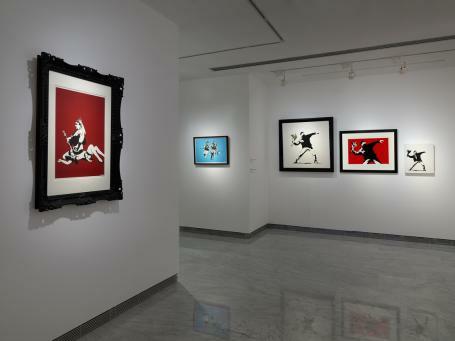 The Palazzo Cipolla hosts Banksy’s work and even highlight his fearlessness as an artist, in terms of media, form and issues expressed throughout. 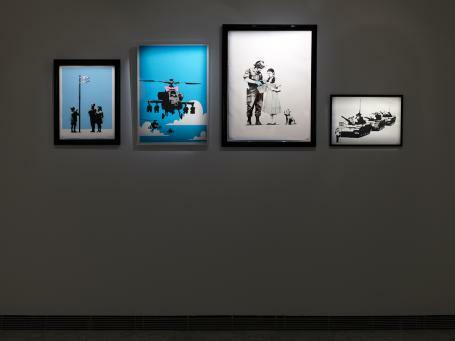 The expansiveness of the show invited an educational aspect to it where the public can engage with the works more critically, it examines how social and political events of our world are viewed through Banksy’s street art. The show takes on an interesting contextual narrative, the exhibitionary space; a monumental building is hosting an artist that is leading the future of the urban art movement. These two temporal polarities instigate interesting discussion in regards to how the past merges with the future to enrich the global art culture. Originally based in Bristol, Banksy has moved on far beyond his local art scene in 1990s, and has become one of the world’s most notorious artists in urban art movement, ha has become one of most discussed, debated and acclaimed cultural figures of our age. Taking inspiration from the Bristol Underground Scene, the artist claims that his distinctive style, which combines stencil and graffiti writing, developed out of a need to quickly create large-scale works. Banksy's work typically includes satirical social and political commentary, and ranges from murals to sculpture and installation, often playing with the contextual aspects of the work. His reputation as an anonymous artist has naturally provoked much disarray in the international art world, but Banksy’s mysterious persona was a powerful advantage as his work has been able to speak for itself and beyond that, it has unravelled issues and afforded a voice for those who would not have been heard otherwise. His artwork reveals a unique mix of humour and humanity, he seems to take a collectivist approach in his creations which make him and his work all the more impressive, and mighty. Although there isn’t a gallery that represents Banksy, Pest Control is an organisation that involves himself and his associates in representing his work and himself as an artist. His anonymity and refusal to conform means that he is as difficult to nail down as is his artwork, and thus a survey of his works has never been officially or unofficially exposed in a private museum to a public audience. The Fondazione Terzo Pilastro is a foundation that focuses on building and developing relations within and outside of Italy to better their communities, educationally, culturally and so on. The Fondazione works towards being a propulsive and creative center of ideas and proposals. 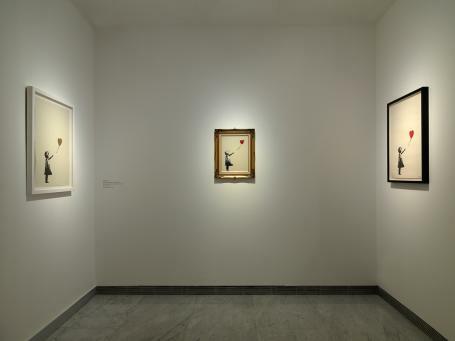 It is the Fondazione that brought together this collection - the space hosts an expansive array of Banksy’s pieces that have been generously loaned from private collections across the world, many of which have not been shared with the public up until now -. 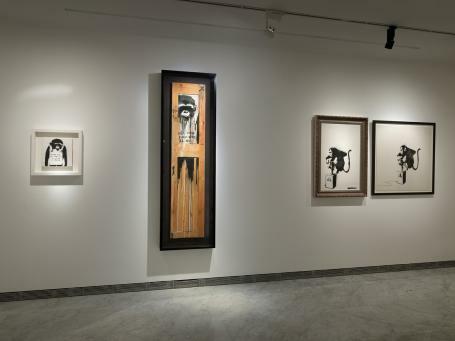 The display presents over 100 artworks including original oil paintings on canvas, large scale installations, limited edition prints, sculptures and rare collectables as it underlining the main inspiration sources: WAR, CAPITALISM and LIBERTY; a trifecta of serious social engagements within the exhibition’s title that embrace a notion of power. 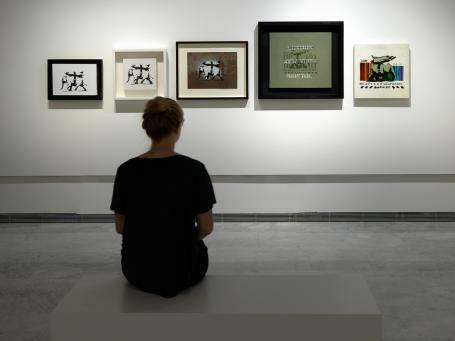 Today, the Fondazione Terzo Pilastro has more visitors than the major Roman museums of contemporary art, it has evolved in to an organisation that engages in the global art dialogue in which they have a large focus on Street Art. 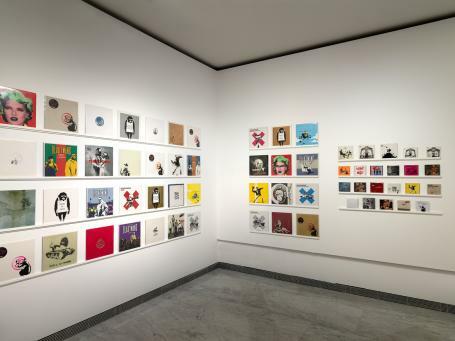 In 2014 they curated Urban Legends, the first exhibition of street art hosted by the Museum of Contemporary Art of Rome, bringing the new generation of street artists face to face with contemporary art. In 2015, the Fondazione has also curated the Source Codes exhibition at the Platamone Museum of Catania, setting a record for the highest number of visitors in that museum. They also participate in consulting the Roma Capitale Municipio Roma VIII for urban requalification through art. 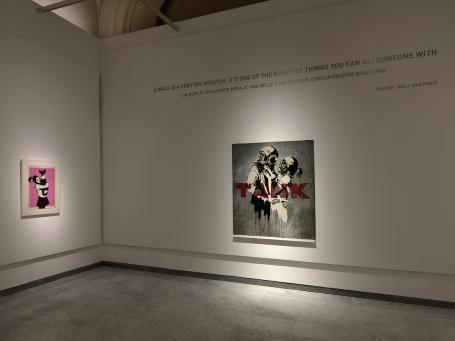 “The exhibition of the artist known as “Banksy", that we will show at Palazzo Cipolla in Rome, thanks to the "999 Contemporary", is a far-reaching initiative”- Prof. Avv. Emmanuele FM Emanuele, expresses his thoughts the artist’s works being shown in a museum setting for the first time – “The exhibition is a unique opportunity also for the themes that it deals with - war, capitalism and freedom - that seem to be both the primary sources of inspiration of Banksy’s art - characterized by a strong component of social protest - and the most current and urgent themes characterizing our present. This exhibition is, in my opinion, the perfect and natural culmination of a path that I wanted to pave, through the Fondazione Terzo Pilastro, starting long time ago, in order to give voice to a form of expression - the street-art - that takes art out of the museums and shifts it into everyone’s places, making it something belonging to our daily lives. A non-academic phenomenon, but alive and vital nonetheless, that I appreciated in my early years in Los Angeles and Miami, immediately realizing its magnitude and great communicative effectiveness. " Acoris Andipa, the director of Andipa a leading Modern & Contemporary Art gallery based in Knightsbridge, London and established as private dealer in 1967. It is still owned and operated by the founding family who were first recognised in fine art in 1593. It is a reputable active player in the Banksy market, exhibiting the artist’s works from their private collection since 2006. The following year, Andipa produced the first major secondary Banksy solo exhibition from its own collection which received 36,000 visitors in 6 weeks. It has been responsible for placing many of the artist’s important works. Stefano Antonelli and Francesca Mezzano are the founders of 999Contemporary, a private non-profit institution based in Rome, devoted to the study, practice and development of urban contemporary art through public art projects, exhibitions, educational and charity projects. They have curated more than two hundred public works throughout Italy and abroad so far, and are very much involved in the production of monumental public works, bringing in artists from all over the world. One of which being the greatest portrait ever painted by human beings on the silos of Catania’s port in December 2015 with the Portuguese artist Vhils and the fundamental support of Fondazione Terzo Pilastro. Another collaborative production with the Contemporary 999 and the Fondazione is painting of the metro station Spagna, the Ostiense district and the entire residential area of Tor Marancia in Rome. Francesca Mezzano is currently President of the Biennial of Young Artists of the Mediterranean. 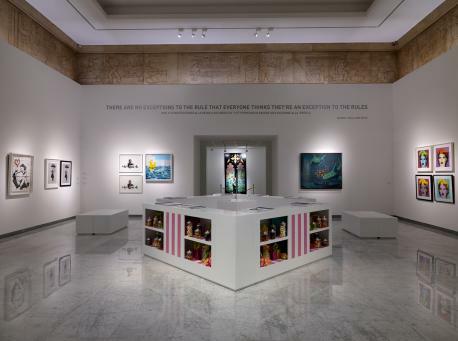 "While generally an exhibition is a large space to distribute the cultural product for adults with a small educational area for children, this exhibition is a great educational space for children and a small cultural space for adults." “When a Foundation, that has been the most important art of our traditions, invests in an exhibition of this kind, it is willing to express its intention to start a high-profile reflection on the interpretation of its time, it is willing to express the need to be contemporary and not just coeval, in order to build the path for creating the virtuous connections between tradition and innovation, between past and future, sharing this way with the public."